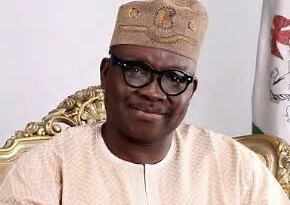 Ayodele Fayose, Governor of Ekiti State, has vowed that the Peoples Democratic Party, PDP, cannot stop him from contesting the 2019 Presidential election. Speaking during a meeting of South West governors in Lagos, Fayose said the constitution of the country far outweighed that of the party. According to Fayose, “I am not on my own, I have most Nigerians behind me. Rather, the PDP is on their own. “I have been well groomed. I am mature and firebrand enough to face challenges of tomorrow. Things don’t happen by accident. When the party (PDP) almost fell apart, how many of them did we see at the time. How many of them spoke at the time. “If they zoned it to the North, so because I am not a northerner, then I don’t have a right, the Constitution does not allow me to contest? Forget that. “What are you saying? Have you not seen in this country where a zone has two key offices? We know where the Speaker is from. During Tambuwal Speakership, the post was zoned to the southwest but because we lost it, a zone got the two top appointments in the land. “It is the Presidency that orders things. When I become President in 2019, I will reorder those things.